The Chrysler 300 has the respectful demeanor of a chauffeur mixed with the bravado inside of a racer, symbolized in a way with its signature grille and wide stance. 017 features are a Ceramic Gray color for the outside, the double Exterior and Interior Sport Appearance Packages, and fine-tuned changes to the 300S model. That Ceramic Gray exterior paint color appears on the 2017 Chrysler 300S and lends it an air of professionalism, plus the 300S has both ventilated and heated seats. The Chrysler 300 has smartphone integration as standard with the Uconnect system (4th-gen), which uses either Apple CarPlay or Android Auto to accomplish that functionality. The interior of the 300 is quiet due to road noise reductions, has the latest connectivity technology, and yet is comfortable as well. The RWD-version of the 300S model works well with a sport-tuned suspension, uses LED foglights, and has a custom steering calibration. There are 2 engines available for the Chrysler 300, and the first one discussed here is the 3.6L Pentastar V-6 variable-valve timing (VVT) engine that generates 292 horsepower (in the standard setup) and manufactures 260 lb-ft of torque. The other second engine is the 5.7L HEMI V-8 VVT with Fuel Saver Technology (& interactive deceleration fuel shut-off), which produces 363 horsepower and easily spins out 394 lb-ft of torque. Both engines work directly with an 8-speed automatic transmission. On RWD Chrysler 300S models there are larger sway bars (with V8 engine), a performance-tuned suspension with increased spring rates, performance-tuned steering and bushings, and Goodyear Eagle F1 triple-season tires. Every 2017 Chrysler 300 model is possible to acquire with the most technologically effective AWD system in the mid-size sedan market today! This AWD system employs an active transfer case and front-axle-disconnect function as it changes between all- and rear-wheel drive (with no driver management needed) to go for the best fuel economy numbers possible. Drivers can choose one of two drive systems, with the standard being rear-wheel drive and the alternate available one being all-wheel drive (for all models). In 2017, the Chrysler 300 has a range of four sophisticated models, named the 300C, 300S, 300 Limited, and the 300C Platinum. The 300C Platinum model has model-exclusive Platinum Chrome touches, a sport mode with paddle shifters, French accent-stitching, 20-inch polished-aluminum wheels, quilted Nappa leather seats and door panels, dual-tone Indigo/Linen interiors (Black is available too), natural-pore wood that is hand-sanded, and a leather-wrapped steering wheel with a special chrome accent halo. Android Auto makes Google Maps, Google voice search, and Google Play Music work through the Uconnect 8.4-inch touchscreen (or steering-wheel mounted controls). Apple CarPlay does the same function for iPhone owners and allows access to Apple Messages, Apple Maps, phone and Apple Music through Siri Voice control (or via the Uconnect 8.4-inch). The 2017 Uconnect system rocks performance items like fast processing power, a short startup period, and HD for crisp graphics. The 8.4-inch touchscreen with navigation works with multi-touch gestures like swipe, pinch, and tap. Standard on the 300C Platinum (and a 300C option) is the 900-watt amp, a subwoofer, and 19-speaker combo (within the Harman Kardon Audio Group). The Uconnect System also helps smartphone integrations occur as standard on all 2017 Chrysler 300 models. The Alloy Edition Package is fresh to 2017 and looks superb on the 300S trim with its black Nappa leather with caramel-colored Stitching, Dark Bronze accenting, and a blacked-out exterior. Can I request an instant trade-in offer? Certainly! Go to our trade-in center to get an instant trade-in offer. Click for the Trade-In Center! Do you have reviews of other models? We do have those, feel free to check those out! Click here for the Models page! Is the 300S model interior different than prior years? The partially redesigned Chrysler 300S interior contains subtle interior accents & materials, plus a 'Black with Sydney Gray' leather interior option has heated & ventilated seats! An option on most models is a SafetyTec Plus package that has Adaptive Cruise Control-Plus with Full Stop, Full-speed Forward Collision Warning, Blind-spot Monitoring, a Lane Keep Assist that integrates with the LaneSense Lane Departure Warning, Advanced Brake Assist, and Rear Cross Path Detection. The standard items for 2017 carry into the Chrysler 300 rain brake support, electronic stability control, head restraints, hill-start assist, and ready alert braking. 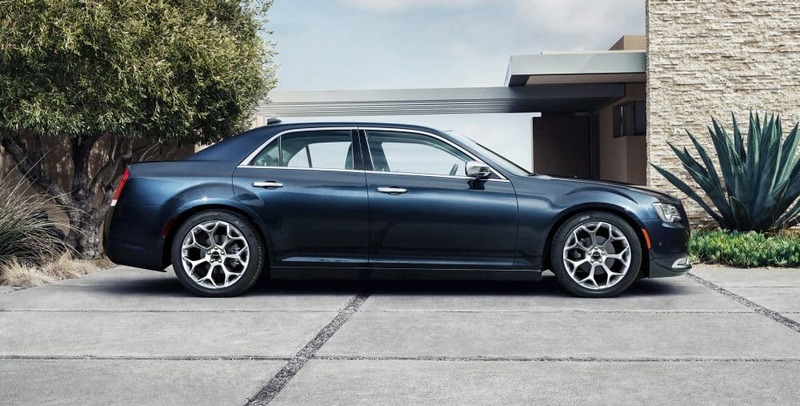 Additionally, the 300 has a Sentry Key theft deterrent system, a display for tire pressure monitoring, a ParkView rear backup camera, and a security alarm. Chrysler wants you to have fun and feel confident due to the fact that they have taken care of the safety within the 300, so come on up to Thompson Chrysler Dodge Jeep RAM of Harford County and try one out with us!